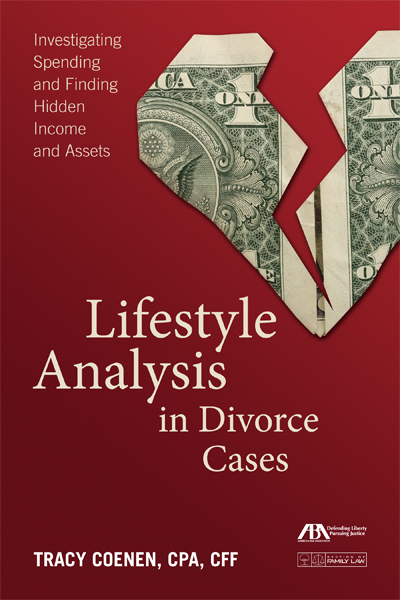 Lifestyle Analysis in Divorce Cases: Investigating Spending and Finding Hidden Income and Assets, published by the American Bar Association, is the only book available on the topic of lifestyle analysis in divorce cases. While there are plenty of excellent books on financial issues in divorce, none of them focuses on the lifestyle analysis, how it is done, and how the results may be used in court. The lifestyle analysis is the process of tabulating and analyzing the income and expenses of the parties. The analysis is then used to determine the standard of living of the parties, which will influence support calculations, and possibly property division. Calculating the lifestyle of the spouses prior to separation can provide insight into the lifestyle the married couple enjoyed and the cost of that lifestyle, as well as the income that was or is required to fund the lifestyle of the married couple. The results may be used to prove a spouse’s financial needs following divorce. In other words, a detailed analysis of the spending during the marriage can be the basis to calculate the funding the spouse needs to maintain a similar lifestyle after divorce. The lifestyle analysis may also help confirm or refute income claims made by a spouse. If a spouse has declared income that is well below the cost of the lifestyle he or she is leading, the lifestyle analysis may suggest that undisclosed sources of income exist. It may also help identify previously undisclosed assets, which may have a substantial impact on the property division. The lifestyle analysis is typically used to sort out the numbers post-separation, but it may also be used to evaluate the finances of each party at the time of a prenuptial agreement. If a party did not make a full and accurate disclosure prior to the signing of the premarital agreement, the spouse may attempt to have the agreement set aside. A prenuptial agreement can also be instrumental in the forensic accountant’s work post-separation, as it provides a point at which to start tracing funds or assets.